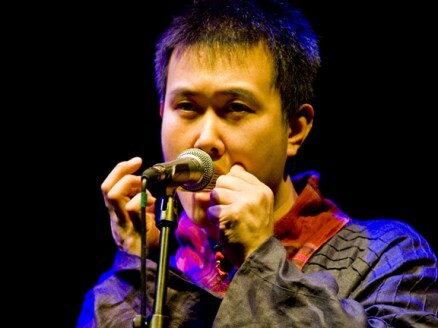 Chinese-born, Paris-based Wang Li is a master of the Chinese jaw harp, sheng reed wind, and calabash flute, creating atmospheric sounds with infinite nuances, using breath techniques and mouth, tongue, and throat vibrations. Contemplative and eloquent, Li’s playing on these ancient instruments produces surprisingly modern melodies—dark and dreamy, with almost an electronic dance music sound. Following a strict upbringing in China, Li travelled to France where he joined a monastery, discovering patience and silence, and an understanding that his musical expression comes from his roots. After studying jazz at the Paris Conservatory, he returned to his native region in China, learning from the few local musicians who play the jaw harp.